[Original article:] Reports are circulating that Michael G. Flynn has been fired from President-elect Donald Trump’s transition team following his tweet about PizzaGate on social media. On December 4th, 2016 Michael G. Flynn tweeted the following message. According to Esquire it was after that Tweet that Vice President-elect, Mike Pence, mentioned that Flynn was never on the transition team, to which the Esquire article points to a New York Times’ article indicating that Michael G. Flynn was once on the transition team. This occurred recently following an incident where a man entered into the Comet Ping Pong pizzeria and allegedly opened fire. CCTV cameras were supposedly disabled a day before the incident and were restored to operation a day after the incident. This was allegedly in response to the ongoing conspiracy involving PizzaGate, which spawned from the Wikileaks Podesta e-mail dump, but was actually going on in the inner circles of politics since a 2011 tweet was made by the deceased Andrew Breitbart. Those attempting to discuss the issue on YouTube have recently found out that their videos are being forcibly removed. Former Huffington Post contributor, David Seaman, did a video notifying his audience that YouTube issued a community strike against his account for a PizzaGate video on the grounds of harassment. Seaman discusses the account strike in a video posted on December 7th, 2016. The video can no longer be viewed due to the strike. However, Seaman was not alone. Other PizzaGate videos are also being hit with content violation strikes, such as the one from Reality Calls, where she shows her audience the message YouTube sent her regarding the community violation. According to the strike, her video was labeled as “harassment”. Once again, you can no longer view the video as it’s been removed from YouTube. Some individuals on the PizzaGate hub on Voat believe that the heavy handed censorship was in relation to information they uncovered relating to ties Comet Ping Pong has to a distillery in Hawaii operated by David Stone. The thread alleges that the Richard Windsor being referenced in the e-mail is former Clinton Foundation board member, Lisa P. Jackson. They come to this conclusion through a New York Times article from December 27th, 2012, where they reveal that Jackson’s pseudonym is in fact “Richard Windsor”. The image attached is of a Mr. Potato Head with his arms folded in front of his face with his eyebrows raised. Dave Stone also has a Mr. Potato Head on his website www.daveflintstone.com. Stone’s name also appears on the Island Distillers site. Apparently Dave Stone runs a distillery out of Honolulu, Hawaii, but he uses the name “Dave Flintstone”. The property is owned by the Bishop Trust Estate. 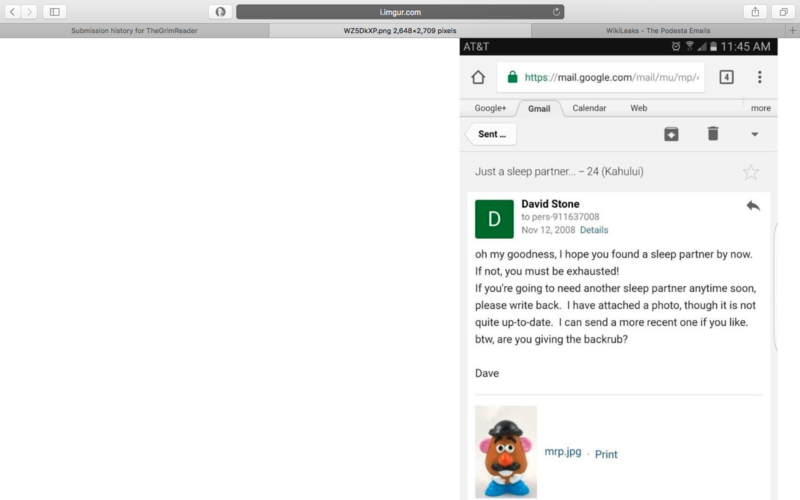 The PizzaGate thread points to a Dave Stone in the Podesta e-mail dump, but have a hard time linking if it’s the same one running the distillery that contacted Comet Ping Pong. What is known is that Hillary Clinton met with Dave Stone back in July of 2009, according to a Wikileaks e-mail. “As of April 21st Dave Stone’s former business partner ( James F. Blom ), and I will establish ‘Stone Harbour,LLC’ (named for Dave) in Delaware. This will be a nice merger of Dave’s and my contacts. Apart from the ongoing vetting of Simon Stringer’s multi purpose software, at several levels, I am keen to help in the human trafficking effort. 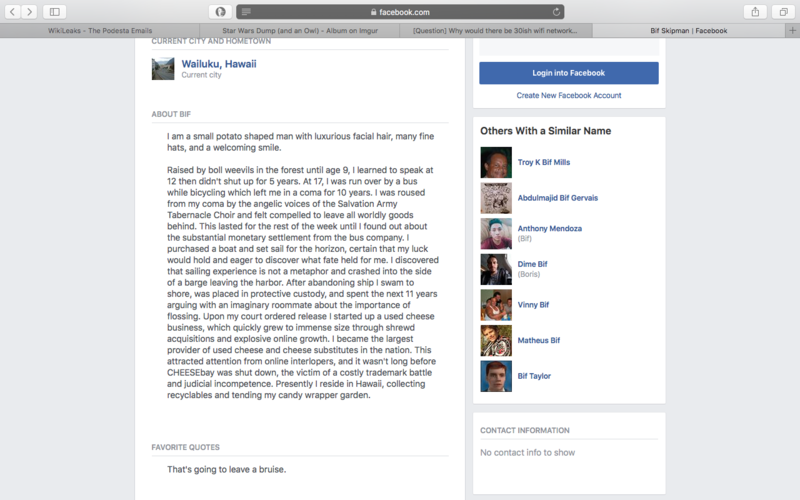 This information was also linked to a mysterious post from a contractor working in Hawaii earlier this year during the summer, who asked in a BlackOps sub-Reddit thread about what the purpose would be of having Wi-Fi signals underground? The contractor was doing work for a distillery he did not name in Honolulu. Although he alleges that the distillery was just a front, as he didn’t see them producing or delivering goods. The OP posted an image to the property and mentioned that he had drilled holes in the ground after picking up the odd Wi-Fi signals and noticed that the property ran on a separate power-grid. After drilling several holes he noticed that when pouring water down the hole the water drained through the concrete and the holes did not fill up, indicating that there was something underneath the ground. He also posted an image of the property. In a separate thread over on Above Top Secret, he mentioned that he was afraid he was working on a government base or some other top secret facility and asked how he could verify it without being found out. He also mentioned that during his work there he mistakenly tipped over a bucket with caustic material in it and some bits of dissolved human flesh came out. He snapped a photo of the bucket during his investigations into the odd happenings of the site. He mentioned that after the bucket incident he decided to quit working there, but he mentioned that he was being followed at the train stations and other places. “[…] i noticed a truck making multiple late night trips for many days removing lots of busted up new looking concrete from the neighbors city trash bins. The property i lived on and that neighbors property are lease holds held by the same person (not my old boss). “I think i stumbled on a possible human trafficking and child p*** ring. The feedback on the Cheesybay eBay account he mentions actually makes no mention of faulty drives. All the current feedback is extremely positive. 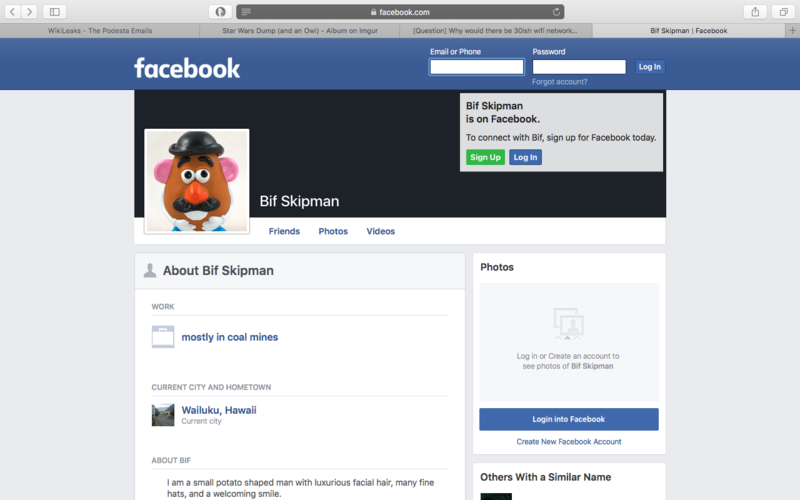 The eBay account was supposedly linked to a “Bif Skipman”, who has a Facebook page that’s still active and it was last updated back on December 4th, 2014. According to some posts, Skipman and Stone both referenced “Poobah” as their occupation at one point, and both feature the Mr. Potato Head avatar. In one profile image of Skipman it states that the “Cheesebay was shut down”. The current profile for Skipman does not reference “Poobah”, but some think Skipman is a pseudonym for Dave Stone. On the Above Top Secret thread, the contractor also references his employer as “Fred Flintstone” to avoid naming direct names. What led many people to think they’re the same is because the contractor mentioned that the guy who ran the distillery ran the Cheesebay account on eBay. 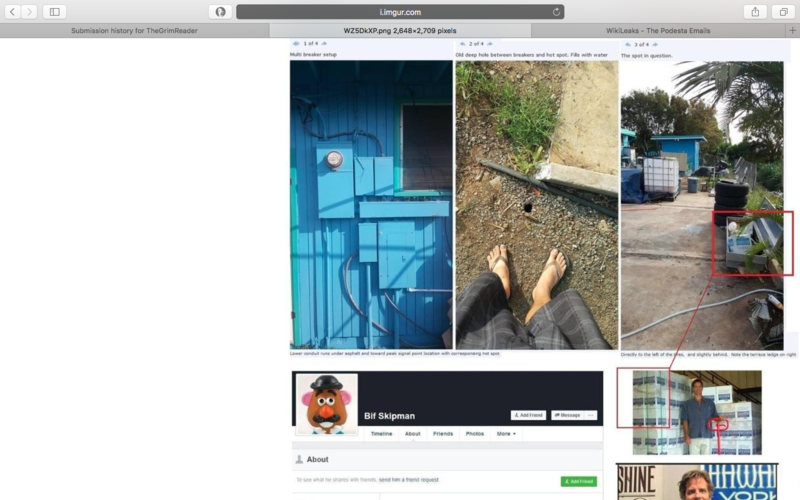 Dave Stone does run the Island Distillers, and on the PizzaGate thread they noticed one of the linked images the contractor took to showcase what the facility looked like, looked similar to the Island Distillers facility from the contact page of IslandDistillers.com. Further images were then compiled where people pointed out that the location of the distillery did seem to match Dave Stone’s distillery location. Shortly after PizzaGate made the “Hawaii Connection” the incident involving the armed man entering into Comet Ping Pong happened, and a flood of news stories hit the wire saying PizzaGate was “fake news”. This also resulted in a sub-Reddit called Operation Bernstein being shut down, and the aforementioned YouTube accounts being hit with community strikes. David Seaman’s page on Wikipedia was also locked and setup for deletion due to his investigation into PizzaGate, as indicated on the Wikipedia talk page. PizzaGate is currently banned from trending on Twitter, and individuals attempting to out pedo rings are being banned on Twitter. Reddit also banned the PizzaGate sub-Reddit. Concerned citizens continue to plea for authorities to do a proper investigation into PizzaGate, but it’s currently being drowned out by the media claiming that it’s all a “fake” conspiracy theory.